Our container program is the perfect solution for towns, businesses or organizations that frequently turn over large amounts of electronics throughout the entire year. If your organization refreshes smaller amounts of electronics at specific times during the year, then we would suggest that you consider our pick up service. Who is our container service best suited for? Our E-waste Container Service is the perfect solution for municipalities that want to offer residents a convenient electronics recycling solution. When considering our container program you will be asked which type of electronics recycling container you would like to have delivered to your facility. You may choose from 2 types of containers that will best suit your needs. We recommend our closed containers if you will be placing the container in a non-gated area as it can be locked, or use our open containers for secure areas. 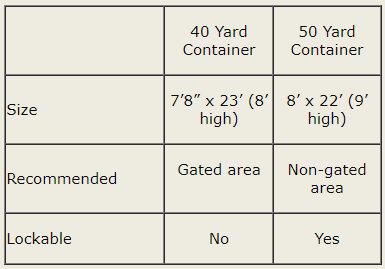 Please be sure to check the sizes of each container below to ensure that you have adequate space to store the container. 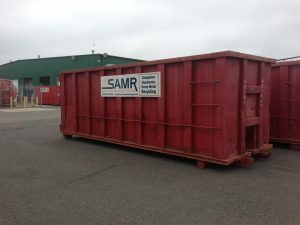 SAMR will come right to your facility and drop off a container for you to fill, once the container is full you contact us and we will come and switch out the full container of e-waste with an empty one so that you won’t have to worry about it. If you’re ready for the ease, convenience and peace of mind while recycling your e-waste with our container program, then simply contact us via a free quote or call 732-370-4100 to speak to a customer service representative.